When twenty-two-year-old Olivia learned that her mother had only months to live, she pulled up roots, leaving Vassar and her career plans far behind to be with her mother for her last days. And yet just four months after her mother’s death, everyone in Olivia’s family seems ready to move on. Her brothers are settled comfortably in careers and families of their own; her father has already begun to date again, inviting a woman named June on a family trip Olivia originally planned with her mother. Still reeling from the loss, Olivia looks for a new start of her own, throwing herself headlong into Manhattan’s fast-moving media world, where she is alternately demeaned by bosses and pursued by men. But as Olivia tries to piece together an adulthood without her mother to guide her, she makes a shocking discovery: a secret romantic correspondence her mother had with a man who only signed each letter “F.” As she tries to untangle the mystery of F, Olivia will journey halfway across the world, to an ashram in rural India, on a quest that will reconfigure everything she thought she knew about her family and her own place in an increasingly complex world. "With a delightfully imperfect heroine, vibrant settings, and snappy dialogue, this is a whip-smart debut." 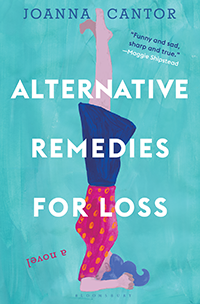 PRAISE FOR "ALTERNATIVE REMEDIES FOR LOSS"
"A sharp and witty glimpse inside a functionally dysfunctional family, Cantor’s first novel is heartbreakingly honest. Fans of Helen Fielding, Emma Straub, and Maggie Shipstead will appreciate Olivia’s zest for life and capacity for personal growth. With a delightfully imperfect heroine, vibrant settings, and snappy dialogue, this is a whip-smart debut."